Seeing action in the Spanish Civil War and World War 2 the He 111 enjoyed early success until the aircraft came up against the modern fighters of the Royal Air Force, forcing the Heinkel He 111 to operate at night. Despite this the type would remain in service, with civilian versions of the plane operating in Spain until the 1970's. Originally designed to be a civil airliner for Lufthansa it was actually the planes potential to serve as a medium bomber for the Luftwaffe that was far more important. Designed by the Gunter brothers Walter and Dr Siegfried, and with roots in the Heinkel He 70, three prototypes of the plane would be produced. The first prototype was flown by Flugkapitan Gerhard Nitschke on the 24th February 1935 at Rostock-Marienehe and was powered by two 660-hp BMW VI 6,0Z engines. The second prototype featured a shorter wingspan and was designed for civilian use with two cabins for passengers and the nose housing the mail compartment and this flew on the 12th March 1935 and this plane would go onto be part of the Lufthansa fleet. 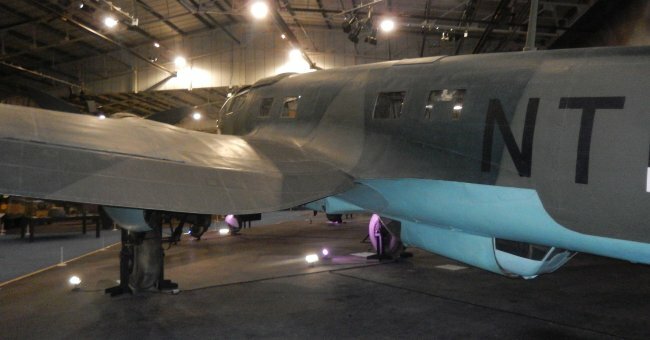 The true prototype of the military bomber was the third prototype, a fourth prototype appeared and this would be used to carry out development work for the civilian version of the plane and this aircraft was revealed to the public on the 10th January 1936 at Berlin's Templehof airport. The military version continued in development and ten He 111A-0 pre-production aircraft were produced and these were similar to the third prototype but with an extended nose. Two of these aircraft were sent to Rechlin for operational trials however the plane underperformed in handling, power and performance and were thus rejected then sold later on to China. To try to solve these problems a fifth prototype was produced and two 1,000-hp Daimler-Benz DB600A engines were installed and this aircraft flew during the early part of 1936 and it would be this prototype which was the basis for the production version which started to roll out at Marienehe during autumn 1936, which were the He 111B-1 and powered by the 880-hp DB600, and the He 111B-2 which had 950-hp DB600CG engines. In fact so pleased were the Reichsluftfahrtministerrum in the improved performance of the Heinkel that they placed an order so large that new facilities at Oranienburg had to be built to manufacture the He 111 and these were completed in 1937. With improved DB600Ga engines the Heinkel He 111D-1 was next but with fighter production having priority for the DB600 engine only a small number of this type appeared. This meant the He 111D-0 aircraft had to serve as a prototype of the He 111E-0 which had the 1,000-hp Junkers Jumo 211A-1 engine installed. By the time production of the He 111E-1 started during February 1938 the bomb load had been increased to 3,748lb, another increase in the bomb load to 4,409lb saw the He 111E-3 appear, with the He 111E-4 having the ability to carry around half of this weight on underwing racks and with the ability to carry an extra 183.7 Imp gal the He 111E-5 was introduced. The F series of Heinkel aircraft saw the Jumo 211A-3 engine power the He 111F-1 of which twenty four were exported to Turkey and forty aircraft similar to the He 111F-1 were designated He 111F-4 and during 1938 were supplied to the Luftwaffe. The G series of the Heinkel He 111 was next with the He 111G-3 built for Lufthansa and used for civilian purposes and this featured a wing which was easier to construct. Next in the G series was the He 111G-1 which featured a new wing, and the He 111G-4 whose powerplant was the 900-hp BG600G. The He 111G-5 was fitted with Daimler Benz 600Ga engines and these were exported to Turkey. The Heinkel H and P series planes were developed at the same time and it was the P series that would be introduced first during 1939 which saw the plane undergo a major facelift, to help the pilots view the nose gun was re-positioned, and power was supplied by a pair of 1,150-hp DB 601 engines. However this version and other P series aircraft were built in few numbers before the H series Heinkels appeared and these would be the most produced series. The first He 111's from the H series the H-0 and H-1 were the same as the He 111P-2 but were powered by 1,010-hp Jumo 211A engines. 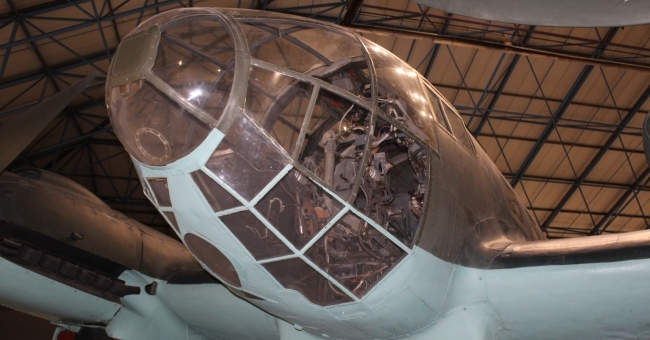 The H series would also see the Heinkel He 111 developed for a range of additional duties. The He 111H-2 with an extra two machine guns was available during the autumn of 1939, with the introduction of increased armament and armour protection the He 111H-3 appeared followed by the Jumo 211D-1 engined He 111H-4 which also included two extra bomb racks to carry a 3,968-lb bomb load. A number of different H series aircraft appeared including the glider tug He 111H-8/R2 and the night bomber He 111H-10 and the He 111H-15 which was to be used as a launch aircraft for the Henschel, Blohm and Voss weapons. Introduced in Autumn 1942 the He 111H-16 was able to carry a bomb load of upto 7,165lb although it needed the help of rockets during take-off. Then came the He 111H-18 which featured exhaust flame dampers to allow the aircraft to perform operations at night, the He 111H-23 which was powered by 1,776-hp Jumo 213A-1 engines and was designed to carry paratroopers. The J series He 111J-0 and 111J-1 powered by 950-hp DB600CG engines were supposed to be used as torpedo-bombers however with under 100 built these aircraft were instead equipped as bombers. The last series was the Z series and this would provide a most unusual aircraft as two He 111H-6 airframes with the introduction of a new wing centre section were merged together with the introduction of a another Jumo 211F-2 engine to enable the plane to tow the giant Messerschmitt Me 321 transport glider and ten examples of this plane would be produced during winter 1941-42. The operational service of the Heinkel He 111 began with 1/KG 154 at Fassberg late 1936 and thirty He 111B-15s were sent to operate with the legion condor bomber unit in Spain during February 1937. The He 111 was the mainstay of the Luftwaffe bombing force during the early part of the Second World War taking part in all the major campaigns at the time including the invasion of France and the low countries and the Battle of Britain where due to the Junkers Ju 88 entering service in larger numbers and the aircraft's vulnerability to the Hawker Hurricane and Supermarine Spitfire saw the plane move to night operations and other roles. One of these roles was as a transport aircraft and the He 111 was involved in the operation to supply the German army trapped at Stalingrad and it would mainly be used in this role as the Second World War drew to a close. Designated the CASA2.111 and built in Spain and powered by either a Jumo 211F-2 engine or the Rolls-Royce Merlin 500-29 a number were built after the war finally retiring in 1973, although production of the military version for the Luftwaffe ended in Autumn 1944 with over 7,000 Heinkel He 111's built. He 111-A Ten aircraft all exported to China. He 111-C Pre-production aircraft, only six built. He 111-D Powered by the 1,050-hp Daimler-Benz DB600Ga engine, but due to engine shortage, only twenty were produced. He 111-F Small number of aircraft built, 24 of which would be sent to Turkey. He 111-G Intended as a commercial airliner. He 111-J 90 built as torpedo bombers but modified to become bombers. He 111-R Intended to be a high altitude bomber, but never reached production.